Once you have arrived at the Chiemsee, finding your way around the lake shouldn't be a problem. There are plenty of ferries, a good local bus network and a special bike path for guests to use. 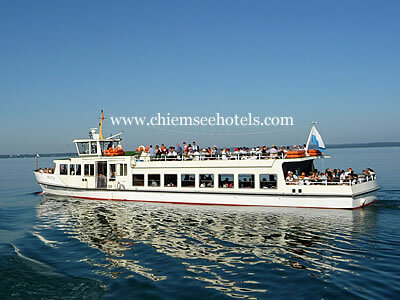 There is an extensive ferry network running between the resorts and villages around the lake and the two inhabited islands in the northwestern part of the lake - the Herreninsel and the Fraueninsel. The company that currently operates the ferries is the Prien-based Chiemsee-Schifffahrt Ludwig Feßler KG, although the first ferry ran its route from Übersee to the Fraueninsel in 1845. The fleet of ferries consists of ten ships which run all year round and which includes a paddle steamer dating from the 1920s. The summer timetable covers both the islands and the resorts of Prien, Gstadt, Seebruck, Chieming, Übersee and Bernau, while outside the summer months the service is restricted to Prien, Gstadt and the islands. Single and return tickets are of course available, but there are also tickets which allow daily unlimited travel and also some which combine ferry travel and entry into the castle of Herrenchiemsee. 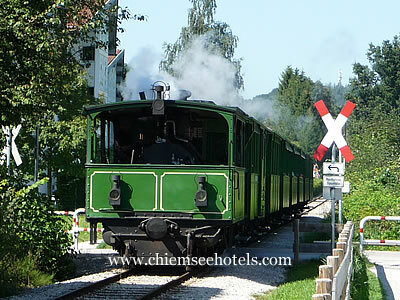 The company also operates the famous steam railway between Prien and the harbour at Stock which dates back to the end of the 19th century and is a popular tourist attraction. There is a circular route organised by the RVO (Regionalvekehr Oberbayern) around the lake with several complete circumferences per day during the summer months. This service - called the Chiemseer Ringlinie - is useful for walkers who want to take advantage of the hiking from one spot to another, or for those using the ferry who want to return by land. There is a well-signposted and protected bike route called the Chiemsee Uferweg, which runs mostly along the shores of the lake. The total length is 60km, but the bus service above allows for the path to be tackled with confidence that there is an alternative should the legs not be up to the full circuit.